Be amazed as you walk along Auckland's famous West Coast with its subtropical rainforest, soaring cliffs, roaring surf and stunning black sand beaches below you. You will have the opportunity to walk on a black sand beach during the guided walk with us, including right up to the roaring ocean itself! Walk along the deserted shore, with the sound of the sea in your ears, the wind in your hair and the salt spray on your face. After pick-up from your Auckland city accommodation, drive to the West, leaving behind Auckland city surprisingly quickly as you pass through Titirangi, which translates to "Fringe of Heaven" in the local Maori language. Titirangi has several nice cafes and bakeries, which the locals love to spend time in. Then enter the beautiful native rainforest that is the Waitakere Ranges, made famous by many movies that have been filmed here. Oscar-winning movie "The Piano" is a good example. As you drive through lush subtropical rainforest, learn about the local Flora and Fauna that inhabit these ranges. Briefly stop at the Arataki Visitor Centre, where in good weather we will be able to show you breath-taking views across part of the Waitakere Ranges, back to Auckland city and the huge expanses of the Manukau Harbour. Auckland has 2 natural harbours, the Waitamata Harbour on the East Coast and the Manukau Harbour on the West Coast. There are several very interesting exhibits on display here about current and past inhabitants of the area, some of which we hope to encounter on our walk deep inside these ranges. Continue on towards the West Coast, where we start our walking trail by winding our way through the forest with many indigenous plants, many of which are very special and which we will show you - including New Zealand's national icon, the famous Silver Fern! Many native plants were used extensively by Maori and we will be happy to show you which ones were the most useful; in fact Maori still use these plants for medicinal purposes today. We will always keep a watchful eye out for the Flora and Fauna that live here. Equally famous are New Zealand's Pohutukawa trees, also referred to as NZ Christmas trees, which bloom in bright crimson-red colours around Christmas time. You will also see mighty Kauri trees that tower over these ranges, plus breath-taking viewpoints over the Tasman Sea, which separates New Zealand from Australia. Have a great picnic lunch in a scenic location with great views. We choose from a variety of wonderful locations and it depends on when you are hungry and what the weather is doing! Then you will be refreshed for a continuation of your walk, which leads through the subtropical rainforest and along the coast as we continue on our way towards one of our most beautiful black sand beaches, where you can marvel at what Auckland's volcanic activity has created for us all to enjoy. You can even see some stunning waterfalls along the way, depending on how far you are able to walk and if you feel like a swim under a waterfall at the end of your guided walk! If you are keen for this option, please let your guide know at the beginning of the tour, so this can be incorporated into the day's plans. 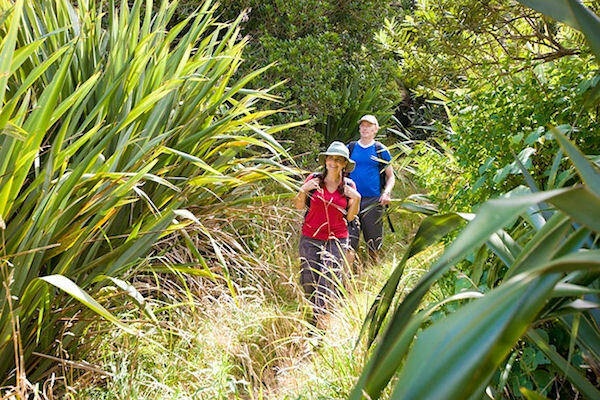 Transport to and from Auckland Central, personal and full day Auckland Wilderness Walking Tour, all equipment, snacks, hot/cold drinks and a delicious picnic lunch, plus all taxes and park fees! Please ensure you bring good walking shoes and clothes suitable for the weather conditions on the day, which we can also help you with. Please wear weather appropriate clothing and walking shoes. Bring sunscreen, swimming gear (during the summer) and your camera.